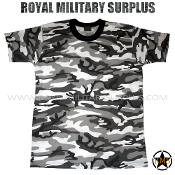 The URBAN CAMOUFLAGE (City/Tactical) Camouflage Pattern has been developed by the US Military Forces around 1990. It was never officially issued but frequently used by the US Special Forces and Police SWAT Tactical Teams in Urban & Industrial Environments. The URBAN CAMOUFLAGE (City/Tactical) is a High-Contrast disruptive pattern with Four-Color asymetrical markings (Black, Light-Grey, Dark-Grey & White). This pattern is essentially a variation of the US WOODLAND (M81 Pattern) and originaly designed for Extreme Cold Weather Woodland Area. Urban & Industrial Camouflages are designed for Closer Tactical Range and better adapted to Straight Horizontal and Vertical Lines Environments. 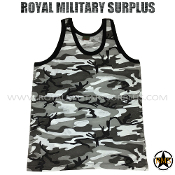 Adapted versions of this camouflage are in use in multiple Military Forces all around the World. 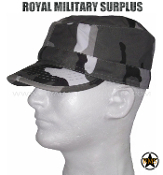 Currently in use by US Army, Navy, Air Forces, SWAT and International Security Forces. 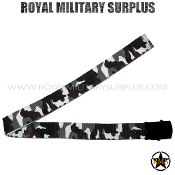 The Canada based Royal Military Surplus online store offers range of quality Military Kits, Combat Uniforms, Tactical Gear and Military Apparel in URBAN CAMOUFLAGE (City/Tactical) Camouflage Pattern.